Brimming with beautiful photographs and renderings, this book is a visual journey as much as a historic record of this community. World War II was over. California had an abundance of jobs for returning vets and a beautiful climate. What it didn’t have was housing for the 3.6 million people who moved there between 1940 and 1950. 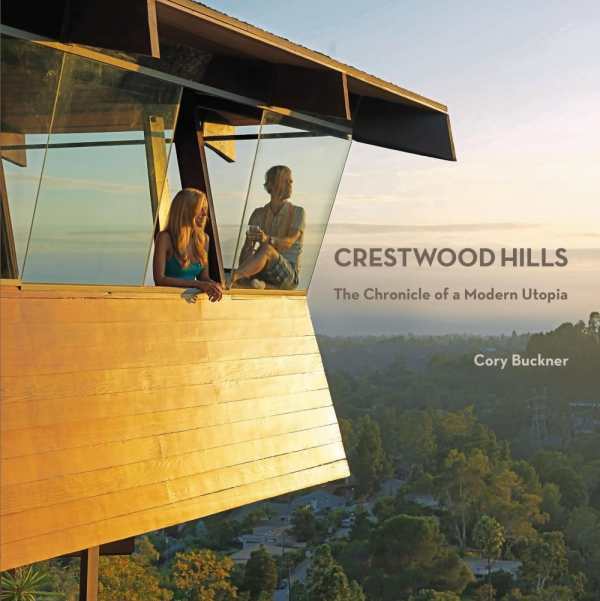 In Crestwood Hills, Cory Buckner explores how a group of like-minded people sought to create architecturally significant yet affordable housing for the middle class and built what would become the only successful large-scale modern housing cooperative in the West. In 1946, four studio musicians decided to pool their resources, buy an acre of land, and build their four houses in the corners, with a shared pool in the middle. As word spread about their idea, more and more people became interested in joining them, and the Mutual Housing Association was born to develop a utopian community with 500 homes and communal services such as a club house, credit union, school, and park, as well as stores and restaurants. Their progressive social ideas were aligned with the progressive ideas of modern architecture, and though the full vision of the MHA was never realized, Crestwood Hills became an important example of both midcentury modern design and the cooperative movement. Buckner, a practicing architect and author of A. Quincy Jones, owns a home in Crestwood Hills and has been working to preserve the original structures, spearheading a movement that has seen eighteen of these homes designated historic cultural monuments by the City of Los Angeles. Her thorough research into this community and A. Quincy Jones, one of its original architects, is evident in the informative text. The 200 beautiful photographs, memorabilia, and drawings spanning sixty years make this book gorgeous enough to display on the coffee table. Some familiarity with architectural terms and drawings is helpful, but by no means necessary, to enjoy this book. Those with an interest in midcentury modern architecture and design, or the history of the cooperative movement in America, will find much to love in this record of a unique neighborhood founded on progressive ideals.